Before CHINICT and GMIC took place, Benjamin Joffe from Asia-based digital strategy consultancy +8* | Plus Eight Star delivered a primer during the Startup2Startup Beijing event on how innovation in China works, and how local companies adjust proven business models from abroad to meet the peculiarities of the Chinese market. A lot has been written about how quickly China’s web entrepreneurs rip off successful concepts from the US and elsewhere, with one local VC half-jokingly at some point telling the GOAP group: “Every site that gets on TechCrunch is sure to have at least one Chinese clone a week later!”. But there are some startups that don’t just churn out 1:1 copies. Instead, a few clever entrepreneurs find twists to make concepts working abroad more China-friendly or mash up existing, successful ones to create original offerings. One case in point is a startup called Lashou whose eponymous service marries Groupon with Foursquare-like mobile mechanics. I had the chance to talk to Lashou CEO Bo Wu during the Startup2Startup Beijing event, and according to Wu, user numbers are currently exploding. CHINICT and GMIC were held at the same time in Beijing (Thursday and Friday), forcing the GOAP to choose between the two conferences and me to decide about which event I should report back (I attended both). I have a personal penchant for covering yet unknown startups (and CHINICT was livestreamed on TechCrunch), so I decided to cover the launch pad that took place at the GMIC. Find short profiles of the three finalists below. The selection highlights three mega trends that can currently be observed in China’s mobile scene: the fragmentation in hardware and software, the rise of mobile gaming, and the low number of people who are ready to make payments over the cell phone. Crossmo is a “cross-mobile” solution that has already been licensed by a number of top tech companies, including Motorola, Orange, Baidu and a number of Chinese operators. Orange, for example, runs its Chinese App Store based on Crossmo, basically as a white-labeled, generic “iTunes” for non-Apple platforms. For end users, Crossmo intends to solve the fragmentation problem in the mobile space by offering an online data management and synchronization tool for cell phones that’s completely hardware agnostic. Just connect your phone to your PC, and the service backs up, synchronizes and pushes all mobile data (music files, ringtones, wallpapers, and other content) into your own personal online “Crossmo Space”. Alexander Krug, CEO of Berlin-based Softgames, said that when it comes to offering mobile content across different platforms, his company has an edge over established gaming giants such as Zynga or Playfish. The Softgames game engine apparently makes it possible to “rapidly” design a social mobile game and then distribute it across a total of six platforms (i.e. iPhone, Android, or Java). SoftGames also pitched CrimeCity at the GMIC, a browser-based mobile RPG that’s available on “all devices and platforms”. Like many foreign mobile content providers, Softgames is currently looking for distribution partners in China and other Asian markets. Market research firm Gartner expects the number of mobile payment users worldwide to ballon to 190 million in 2012, up from the 70 million counted last year. And since 85% of those 190 million people will be based in Asia/Pacific, Singapore-based e-commerce payment solutions provider 2C2P is looking at a huge future market for itself. The core offering in the mobile area is 2C2P Mobile, a solution for cell phones that uses QR codes, Bluetooth, BUMP and other technologies to transfer money between different credit/debit cards without friction. The company was selected as the winner of the GMIC startup competition. 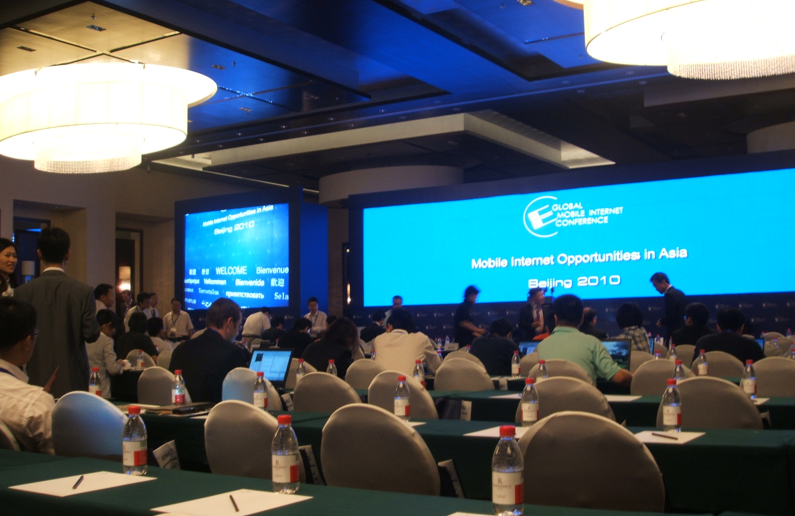 Find a larger cross section of local mobile startups in my previous article on the 3G Industry Summit in China from last year. Many thanks to the CHINICT and GMIC organizers for the special treatment the GOAP group received. China’s high-speed Internet industry is already huge, still offers plenty of room for even more growth, produces one startup after the other, is eager to globalize quickly, and has – unlike its counterparts in many other Asian countries – an iron grip on the domestic market. After gaining a 10,000 foot overview of China’s tech scene, it’s now time to explore what’s currently hot in Korea, the next stop of the GOAP Asia tour. The GOAP will be attending a Korean startup pitch event and the Startup Weekend Seoul (the country’s first ever), before moving on to echelon 2010 in Singapore.